In Colombia young men are required to do military service. Batidas are military raids in poor neighborhoods that target youth who have avoided doing that service. They look for young men without the card that proves that they have done, or somehow gotten out of, their military service. Those who do not have a card on them are whisked away, not to be seen again my family or friends for months. The city government of Bogota recently signed an agreement with the local batallion that they would stop doing these in the city - but it turns out that batallions from other areas have been coming in to the city to do this sort of forced recruitment. I'm not sure about this rendition in English for the term, but it's the one used by Emily Schmitz in this great article about batidas and the conscientious objectors who struggle against them. Dusk settles slowly, covering the soldiers in a soft purple light as they get in formation, lining up together side-by-side. Tomorrow they will leave the training base to begin their two-year military service. Conscription is mandatory in Colombia, with the exception of a few cases: victims of displacement, sole children and heads of households, physically or mentally disabled, indigenous people. And sometimes, even people like Juan Carlos – self-declared conscientious objectors – are released. 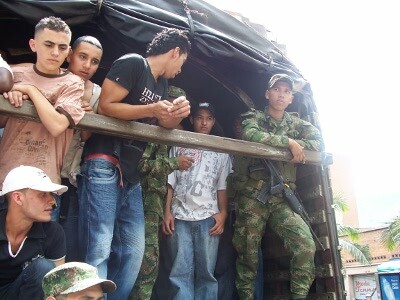 Colombian conscientious objectors uphold the right to refuse mandatory conscription through a constitutional provision (pdf) that details freedom of conscience, guaranteeing that: no one will be importuned on account of his or her convictions or beliefs […] or obligated to act against his or her conscience. But without legal parameters to regulate the law, cases of conscientious objection are confusing and time consuming. With the exception of one officially recognized case, the majority remains unrecognized. There are instead far easier, albeit illegal, ways out of military service: under the guise of mental instability, physical limitations, or simply by paying their way out, defiant youth successfully avoid conscription. But conscientious objectors, fighting to pave a legal path toward military exemption, see the difficulties of navigating the legal system as a means of silencing a public criticism of a practice that has helped perpetuate more than half a century of civil war.